Surgical procedures typically occur in the morning followed by post-operative examinations, treatments, and laboratory reports. As we will not have the latter completed until 1:30, please call between 1:30PM and 3:00PM to check on your pet’s condition (and when you may pick him/her up). Should your pet have a sudden change in condition, we will make every effort to contact you as soon as possible. 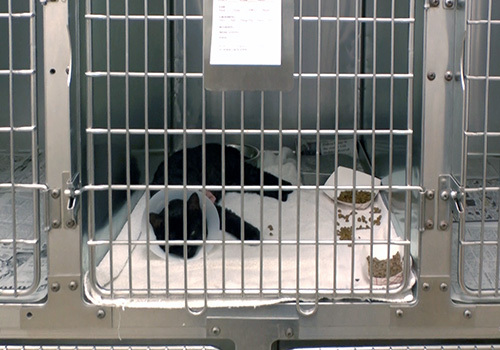 Both restricted activity and strict confinement are essential during your pet’s entire convalescence period. Make sure your pet is on a short leash when he/she goes out to eliminate. Should you need to leave your pet alone during this time, he/she should be confined to a cage or other small area. Additionally, your pet may leave our clinic with a protective collar to prevent licking – which often becomes chewing – of the incision are and sutures. Without the collar, licking and/or chewing can quickly lead to infections that are difficult to treat and often require hospitalization. Similarly, excessive activity can lead to injury and serious complications, leading to more discomfort for your pet – and more expense to you! As your pet’s incision should look better every day, carefully observe it daily for signs of redness, discharge, or excessive licking. Don’t hesitate to call us if you observe any abnormalities. Your pet should improve gradually each day. If his/her condition changes or suddenly worsens, call us as soon as possible. We want to make sure your pet returns to a normal and pain-free lifestyle as soon as possible!